With all the finesse of a damp squib, HS2 have finally got round to moving their website to the .gov.uk domain – you can link direct here. 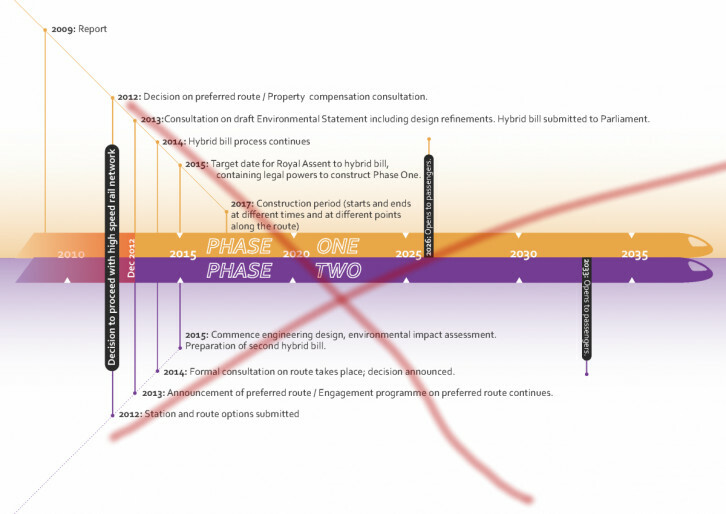 The content is still being migrated, but one thing they won’t be moving is the old graphic showing the proposed timeline for HS2 – this has been too embarrassing for them to leave up for some time. For Phase 2, the route was supposed to be announced in 2014: now delayed until later this year – if they get round to it. Under the original plans, the Phase 2 engineering design and environmental impact assessment were supposed to have started – but if, as the Department for Transport claim, no decisions on the route have been made, HS2 Ltd can’t sensibly do these. The graphic shows the target date for the Phase 1 HS2 hybrid bill royal assent was 2015 with construction starting in 2017. However, even the most optimistic guess for royal assent is 2016: at the Transport Select Committee on 17th November 2014, David Higgins, chair of HS2 Ltd, said they were “still forecasting Royal Assent by the end of 2016, which would allow construction to start 2017”. So, regardless of the new website, one thing seems certain: delays and more delays on the HS2 line. PS The original graphic is still available here.